Last year, the world celebrated the centennial of Thelonious Monk, whose music — at this late date — still sounds remarkably fresh and utterly original. One hesitates to make hard-and-fast judgments about why any composer’s work endures, but surely in Monk’s case part of the reason lies in the idiosyncrasy and originality of these compositions. The quirky rhythms, piquant dissonances and angular melodies that distinguish so many of Monk’s compositions render them unlike anyone else’s and, therefore, ever fresh. Meaning that no matter what you do to a Monk tune — play with its chord structures, embellish its melody, change its rhythmic context — the spirit of Monk somehow prevails. Beasley has tested that thesis in two eponymous albums with his MONK’estra, which, as its name suggests, brings Monk’s music to an orchestral palette. What’s more, Beasley’s arrangements in some cases apply funk, electronic and other seemingly anachronistic influences to Monk’s music, as if pushing this repertoire to a stylistic breaking point. 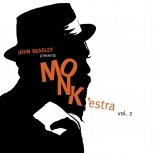 Each listener will decide whether the experiment works, but in concert Beasley and the MONK’estra made a compelling case for the extraordinary malleability of this music. As Leonard Bernstein used to say of George Gershwin’s “Rhapsody in Blue,” Monk’s tunes ultimately are indestructible. Considering all the instrumental firepower that Beasley convened, the concert got off to a surprisingly lackadaisical start, with Monk’s “Epistrophy.” The casual tempo, nonchalant delivery and bland tonal palette represented an anemic way of opening the set. But by the time Beasley and friends reached the final pages, they’d begun to summon the rhythmic energy and sonic heft that would define the best parts of the evening. Certainly the arrival onstage of harmonica soloist Gregoire Maret, to collaborate with Beasley and the band in Monk’s “Brake’s Sake,” brought much-needed tension to the proceedings. To hear Maret improvising freely over the orchestra’s pulsing accompaniment was to savor the clash of two epochs: Maret’s bebop-inspired lines and the band’s funk-tinged backdrop. Though these forces sometimes pushed volume levels too high for this room, the excitement of the give-and-take at least explained why. And a concluding passage in which Maret took flight with only the reeds backing him gave this piece — and the entire enterprise — quite a lift. Indeed, with each work the musicians sounded increasingly persuasive, as if warming to the repertoire and its demands. The melancholy undertone they expressed in “Ask Me Now” and the exquisitely detailed orchestral writing in “Criss Cross” — the tour de force of the evening — underscored the value of this enterprise. For once, Beasley and the band found their voice, they left no doubt that Monk’s music can adapt to practically any aesthetic circumstance. Tenor saxophonist Melissa Aldana opened the evening leading a quintet, her Orchestra Hall debut reaffirming earlier impressions of her work in a club setting. For even in a large auditorium, there was no mistaking the airy translucence of her sound, nor the cerebral quality of her phrase-making. She opened with her “Over There,” the nearly vibrato-less quality of her timbre and the ornate nature of her lines giving listeners a great deal to ponder and absorb. This is not a musician, in other words, who opts for theatrical, audience-pleasing ostentation. On the contrary, Aldana tries to pack as much melodic content and harmonic complexity into her solos as possible, the sheer intricacies of her statements worth studying. Aldana has found an excellent foil in trumpeter Philip Dizack, whose ballad “Box Office” gave this set some of its most lyrically profound moments, especially when he and Aldana played in unison. If anyone wondered why she won the 2013 Thelonious Monk International Jazz Saxophone Competition, the reasons were plain to hear, and plentiful.